Lenira Haddad of Brazil reflects on the policy development and implementation of integrated early childhood education and care services (ECEC) within a systemic perspective. 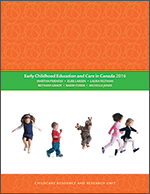 Using the broad, holistic and coherent framework of ECEC conceptualized by the OECD 12 country thematic review of ECEC, she proposes a "third model". This new paradigm shifts ECEC from an exclusive family responsibility to a partnership between the state and family. It also redefines integration as a concept that goes beyond local and administrative dimensions but one that also requires fundamental attitudinal changes regarding the role of the state in the care, socialization and education of children. The implication of this paradigm is of great significance. It demands a deep review and redefinition of the functions, objectives and operation of services for young children. Within this framework, the formation of networks (between departments, sectors and ministries) becomes a natural consequence of the interconnectedness of early childhood services and family life. trends, benefits and concerns regarding the process of integration. This paper was commissioned by the OECD and UNESCO as a contribution to the International Conference on Early Childhood Education and Care hosted by the Ministry of Education and Science on 13-15 June 2001.